In writing about the origins of the Head and Aluflex aluminum skis during the postwar years, ski historians have focused on the transfer of aviation technology from Glenn L. Martin Aircraft (Howard Head’s wartime employer) and from Vought-Sikorsky (employer of the TEY trio, Arthur Hunt, Wayne Pearce and Dave Richey). Because Head worked on succeeding versions of the Martin B-26 Marauder medium bomber, and the TEY team assisted in the evolution of the Vought F4U Corsair fighter, ski historians have assumed – and often stated – that the composite structures they created for postwar skis were derived from those two airplanes. That’s not actually the case. Neither the Marauder nor the Corsair used the compound sandwich structures that made the new skis unique. Both aircraft were designed very rapidly in 1939, and had innovative features that made them extraordinarily fast for their era. Both adopted some new construction techniques – but none of these featured composite sandwiches. The Marauder had a uniquely streamlined fuselage and engine nacelles, requiring compound curves in the aluminum skin. Engineers led by Peyton Magruder came up with a new way to form the single-layer skin panels. To get the smoothest possible airflow over the aft fuselage, the Corsair employed a new technique to fasten single-layer aluminum panels without rivets: the panels were butted together over the frame and spot-welded into place. Neither of these techniques were used in the prototype Head or Vought/TEY skis. In 1945, long after the Corsair was designed, Vought assigned the TEY team to create a consumer product that could take up production slack for the postwar years. The company chose this team because all three men were skiers, and the idea was to use Metalite construction to build a laminated aluminum ski. Metalite was an aluminum sandwich with a balsa wood core, made possible by Redux, a new phenol-formaldehyde-vinyl glue developed in England in 1941 and used in aircraft construction beginning in 1943 (the U.S. patent was filed late in 1944). Redux was designed specifically to glue metal and other impervious materials. Vought tried out Metalite in the F6U Pirate (photo top), an unsuccessful jet fighter designed in 1945. Vought’s first mass-production aircraft to use Metalite skin panels was the postwar F7U Cutlass shipboard jet fighter. commercial airliners. This is the stuff familiar to skiers as the heart of the Hexcel ski (and the Hart HC Comp, and Century skis, and a lot of superlight XC racing skis). Vought built 1,000 pairs of the original wood-core Truflex ski, a Metalite sandwich, making it the first aluminum ski to see mass production (photo right: Attenhofer Metallic, TEY Alu 60, Vought Truflex). Because postwar Corsair sales remained strong (the French Navy bought new Corsairs to rebuild its fleet of aircraft carriers; the US Navy and Marine Corps bought new Corsairs for use in Korea), the ski turned out to be unnecessary, and was dropped. When the TEY team launched their own ski in 1947, they couldn’t use the Vought-patented wood-core design, so their Alu 60 was a hollow beam using nested hat-section aluminum elements on top, and a flat aluminum base -- at first riveted together, and later all bonded together with Redux. The hollow-beam ski, an undamped spring, proved nearly unskiable on hard snow. In the early 1950s, the TEY company invented snowmaking. That technology instantly outsold the Alu 60 ski, so the company licensed production to Attenhofer in Switzerland. Adolf Attenhofer contracted with sporting goods manufacturer Charles Dieupart to build the ski in France. In 1956 Dieupart, with the help of racer James Couttet, solved the skiability problem by reengineering the ski with a wood core under the hat-section top plate. The ski thus became the Aluflex and was a commercial success. A decade later, after Aluflex merged with Starflex to become Dynastar, race director Jean Liard put a flat plate atop the hat-section channel to creat the fabulously successful Dynastar MV2 GS race ski. Dynastar called that hat-section rib an "omega," and it became the factory's hallmark for decades. 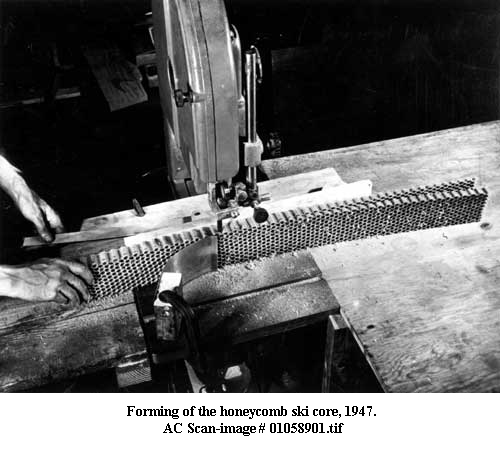 Meanwhile, Howard Head used the Chromex-process plasticized honeycomb as the core for his early 1947 prototypes, using Redux or a similar metal-friendly glue to attach the aluminum sandwich layers. When these skis proved too fragile for real-world skiing, he resorted to a vertically laminated wood core (edge-on marine plywood), similar to the original Vought ski. But Head used Bostik, a powerful but flexible contact adhesive developed during the war from rubber-based shoe-sole glues. Bostik allowed the adjacent layers to flex easily against one another without coming apart. It helped Head skis feel smooth and snaky over rough icy trails. Today Bostik is widely used under wood flooring and in non-structural aircraft interiors. Photos: Vought F6U Pirate jet fighter, the first American aircraft to use a Metalite skin. US Navy photo.